Living in a city or in an area where stores are within walking distance can mean a lot of carrying. While lugging three bags full of groceries and other accessories might not be that big of a deal to some people, it can weigh down others. Enter the shopping cart with seat. Not only do these carts help you carry home the items you need, but they also provide a chair, so you have somewhere to rest while waiting for the bus. The seat can also give you a place to relax when you’re watching a game in the park or just lounging outdoors on a beautiful day. Why Buy a Shopping Cart with a Seat? A folding shopping cart with seat is a smart buy for several reasons. First things first, it takes a literal load off of your back, arms, and shoulders. Shopping carts with seats are also more flexible than you think. Most models fold, which makes it easy to tuck them into a car or taxi. You can also easily lift an empty, folded cart onto the bus, especially if your area has “kneeling buses,” which lower when the driver opens the door. Although people often assume shopping carts are just used for grocery shopping or trips to the corner store or local markets, they are much more flexible. You can fill your cart up with laundry and wheel it over to the laundromat. While your clothes wash and dry, you have a place to sit. One last reason to buy a shopping cart with seat. It can cut down on the number of errands you have to run in a day or over the course of a week. Since the cart does the carrying and lifting for you, you’re able to buy more than you would if you had to bring everything home in your hands. Not all shopping carts with seats are created equally. Some are so flimsy; you wouldn’t dare sit down on them. Others offer limited carrying space, and some have wheels that just don’t cut it over rough or uneven sidewalks. Wheels. It’s not just the number of wheels you want to look at when choosing a cart. You also want to pay attention to the positioning of them and their materials. Cheaper carts often have pretty flimsy wheels. The cheaper the wheels, the rougher the ride with the cart. You want wheels that have some thickness and that are made of a sturdy material, such as rubber. Additionally, you want to pay attention to whether the cart has “stair climber” wheels or not. Stair climbing wheels are three smaller wheels stacked on top of each other in a triangle shape. They make it much easier to pull the cart up and over curbs or up a flight of stairs if you need to. Storage capacity. The bigger the cart’s storage space (usually in an attached storage bag), the more you can carry during each trip. That said, you want to be careful not to get a cart that can carry too much, as you don’t want to risk overfilling the cart and having it be difficult to push. Materials. Durable materials are a must — you don’t want your cart breaking down on you or the storage bag or seat tearing while you’re trying to use it. Many carts feature seats and bags made from a rugged polyester. The frame of the cart should be metal. Seat dimensions. You want a seat that’s big enough to hold you. Some carts have seats that are pretty small and that seem designed only for the most petite of people. Seat weight limit. The weight limit is also an important thing to pay attention. Ideally, the seat will hold at least 200 pounds, if not more. Some seats have weight limits of just 150 pounds, which limits who can use them. Nicely Neat’s shopping cart with seat has several things working in its favor, which led to us calling it the best overall. First, it has stair-climbing wheels on the back, so that it’s easy to lift the cart up over curbs or stairs. Second, it has a pretty sizable storage tote, made from a water-repellent fabric. The tote opens at the top with a drawstring and has a flap to keep out water. It also has two pockets on the side, perfect for storing small objects, and a zippered pocket in the back. Although it’s got plenty of room for storing the goods from day’s shopping trip, the one drawback of the cart is its seat. It’s perfect if you’re small and lightweight, but if you weigh more than one 130 pounds, this isn’t the cart for you. The Maxam Trolley Bag with Folding Chair puts more of a focus on the chair than on its storage capabilities. 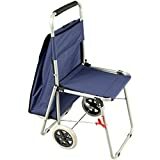 That can work in your favor if you weigh more than 150 pounds and are looking for a portable seat that can also carry your stuff. The trolley with folding chair can hold up to 220 pounds. It’s also priced a bit lower than similar models, so you don’t have to break the bank to take a break now and then. The waterproof outer bag features a special lining keeping contents safe from moisture. The outer bag may be removed and used separately. The padded handle and 35" height makes ArtComber easy to use and it sets down firmly in place. Get it for grocery shopping, mall shopping, pleasure trips, plein air painting, recreation and show use. 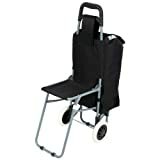 It makes transporting supplies so simple and allows you to sit down and relax while painting, shopping or resting. It even can hold a full size French easel. Large diameter wheels go over curbs and can navigate over any terrain easily. The chair can be closed with one hand, making ArtComber convenient and easy to hold. Unlike most outdoor chairs, this one sets up 18" off the ground making sitting comfortable and relaxing. Get it for grocery shopping, mall shopping, pleasure trips, plein air painting, recreation and show use. Compared to our other picks, the ArtComber Folding Big Wheeled Rolling Chart/Art Cart seems to put sturdiness and stability front and center. It has large wheels that can easily handle bumps in the road, and that go up over curbs without a problem. The cart’s seat is wide and higher up off of the ground than other shopping cart seats. It’s 18 inches from the ground, which makes it easier to sit in. The handle height is also pretty high, 35 inches. 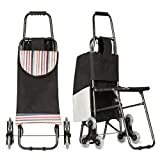 If you’re looking for a shopping cart that won’t break the bank, that’s easy to navigate around town (and even on stairs) and that offers plenty of space for storing your stuff, the Nicely Neat Stair Climbing Multipurpose Folding Utility Cart with Built-In Seat is the clear winner.